Siomay (also Somay), in Indonesian cuisine, is a light meal which is similar in form to the Chinese Dim Sum, shaped like an ice cream cone, except the bottom is flat. Left: Siomay consisting of dumpling of fish and steamed vegetables, tofu, potato served in spicy peanut sauce and black and thick sweet soy sauce. It is traditionally made from mackerel fish meat served with peanut sauce. Sometimes the main ingredient can be made from prawn or other fish. One famous variety of Siomay is siomay bandung, in which the Siomay is eaten with a peanut paste, sweet soy sauce and a dash of lime juice. 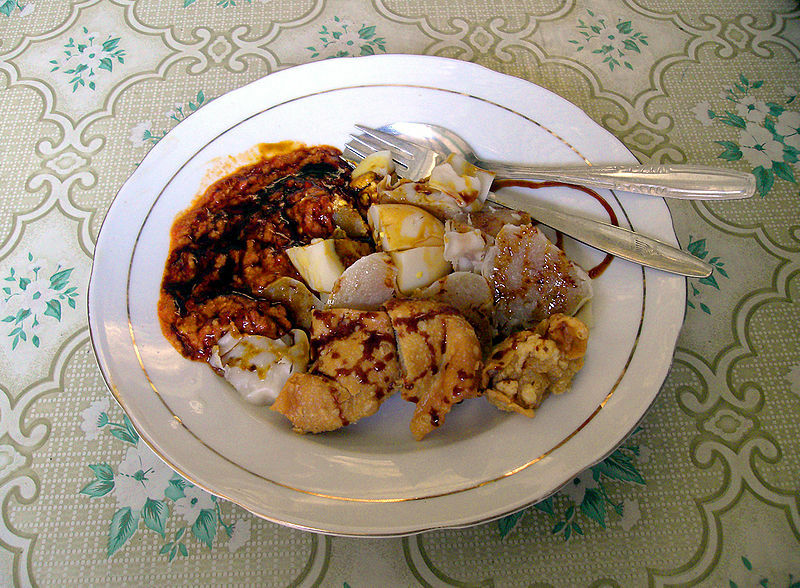 Other complements to siomay bandung are steamed cabbage, steamed potatoes, steamed bitter gourd and steamed tofu.